Ryan Harrison is looking to have his best season yet in 2014. 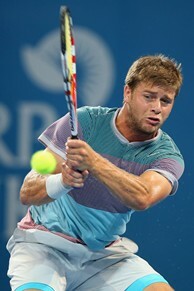 MELBOURNE – Ryan Harrison has always been one to put his nose to the grindstone, but after a difficult 2013 that saw him catch an aggressive virus in the fall and have to shut his season down early, he was more serious than ever about upping is fitness level. For the first time, he spent five straight weeks at the USTA Player Development Headquarters in Boca Raton, Fla. He finally left on December 23, when back to full health he boarded a plane for Brisbane, Australia, to play the qualifying. Harrison trained under the legendary fitness trainer Pat Etcheberry, who has taught dozens of top players including two former No. 1s, Justine Henin and the United States current Davis Cup captain Jim Courier. The 21-year-old Harrison also worked diligently on his technical game. The private coach Brad Gilbert came down for a week to Boca as a consultant, and like USTA men’s coach Jay Berger, he encouraged him to try and strike big forehands after his serves as a way to attack his opponents. They told the 6-foot-1 all-courter to go for his shots on his first strike off the ground. Harrison practiced it again and again in practice and got more and more comfortable doing it, saying that he now does it well. The Louisiana native also worked on making his backhand more offensive so he can push his foes back and establish court position. Harrison considers Berger his head coach, but he is currently traveling with another USTA coach, former Davis Cup captain Tom Gullikson. Harrison and another young American, Denis Kudla, are sharing Gullikson as they are playing similar schedules. Harrison broke out as a pro earlier than his peers, which is perhaps why the expectations for him have traditionally been higher. Harrison reached a career-high ranking of No. 43 in 2012, but after finishing 2013 with an 11-21 record, his ranking sat at No. 99. At the start of this season, Harrison qualified for Brisbane and Sydney, but he lost in the first round of both. Still, he did win six matches at the two locales as opposed to two losses. Harrison has now been on tour since 2010 and has no intention of hanging around the Challenger level, although he is willing to compete in them to get his ranking back up. But in 2013, he admittedly doubted himself. “For whatever reason last year I just let the pressure and the circumstances let me mentally fold, and that's something I had never done before,” he said. “My MO coming up was: I’m not going to fold and I was going to win a lot of matches in three sets and compete the hell out of people and turn matches around. The standard I want now is no points off, no points for granted, and have it be a complete battle all the time. Harrison is a self-confident person and won't back away from matches of any kind, but he has had some rough draws at the majors, including having had to play two members of Big 4 at the Australian Open, Andy Murray and Novak Djokovic. And while his opponent in the 2014 edition of the Australian Open, 25th-seed Gael Monfils, is not a Grand Slam winner, he is former Roland Garros semifinalist and Top 10 player. Harrison isn’t favored in the contest, but perhaps this is the season when American is ready to take his first big victory at a major.